Looking for a different outdoor activity to participate in other than the usual soccer, marathon and the likes? 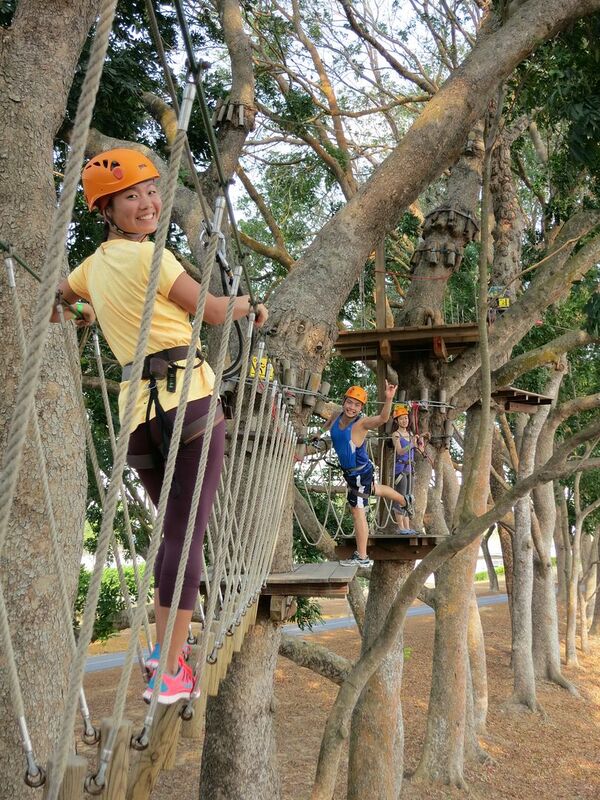 Well, check out Forest Adventure, the first tree top adventure course in Singapore. 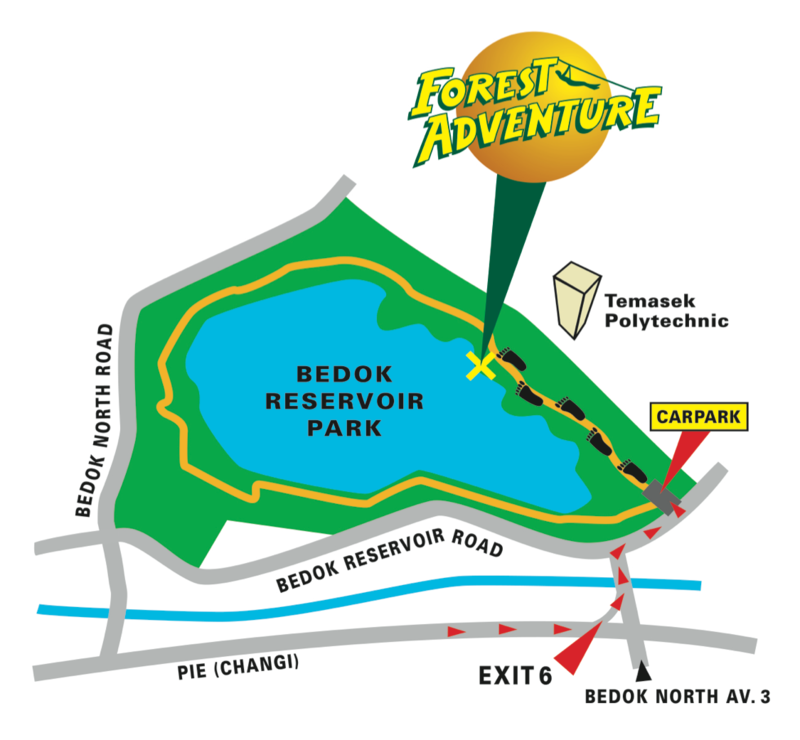 I was surprised that Forest Adventure has been opened since 2007 at Bedok Reservoir Park! This kinda shows that we hardly venture outdoors! Terrible terrible us. 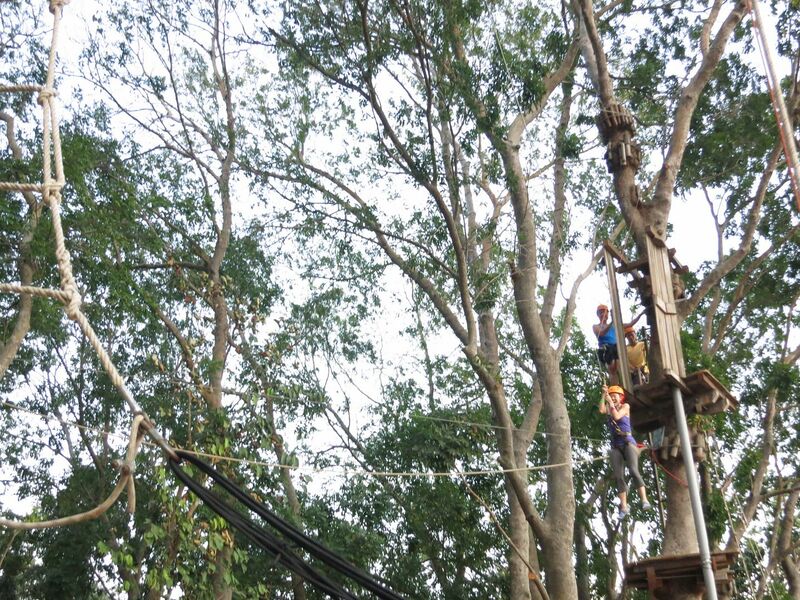 The aerial course through the trees comprises ladders, bridges, swings, nets, trapezes and slides where participants move unaccompanied, from tree to tree, through 34 obstacles, 5 meters above ground. Don't worry, you'd be harnessed and hooked on to the line and will not fall off if you've performed all the safety checks. 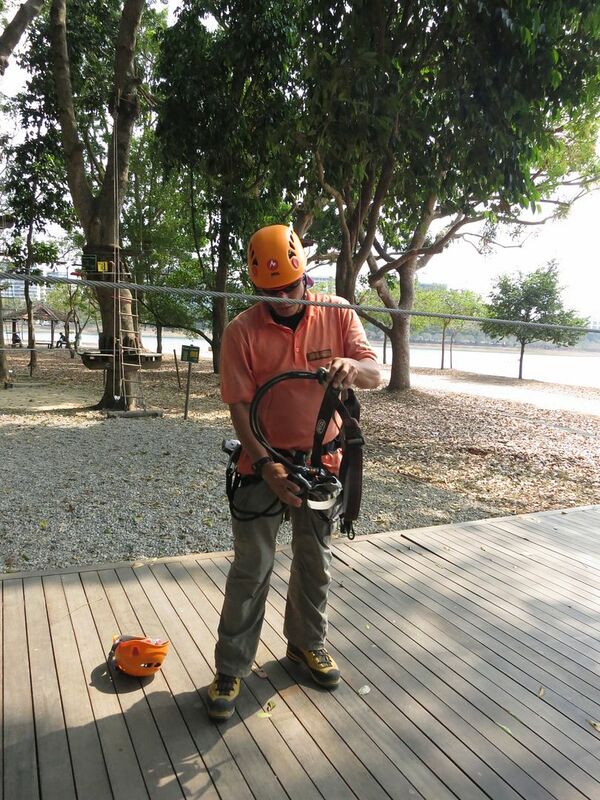 Before embarking on the Grand Course, we went through a 30 minutes safety briefing to operate our safety harness. We then started our 2 - 2.5 hour adventure through 4 sites. The obstacles focus mainly on balance and some strength (when you lack the balance). 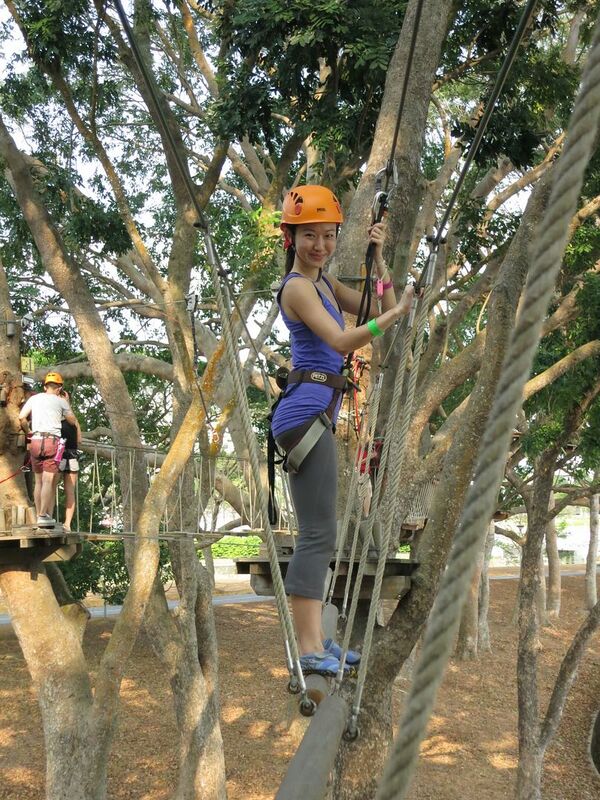 It is also a lot about conquering fears (at least for me). 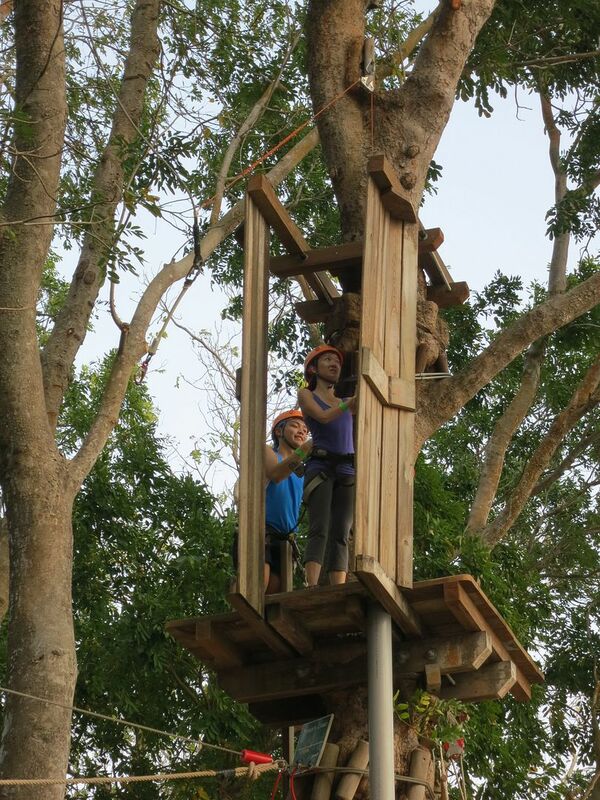 Once i got the hang of the safety system, the height wasn't so much an issue. 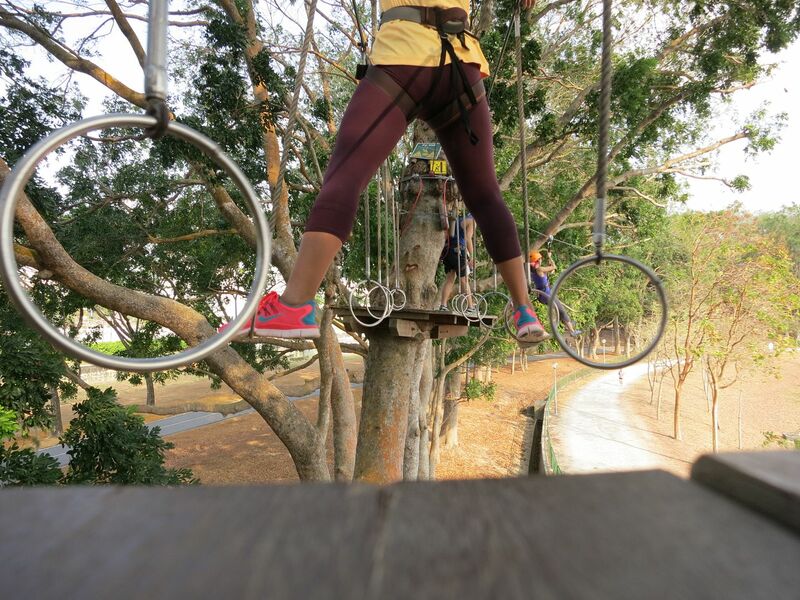 There are some “extreme” sections made of extremely physically challenging obstacles which require some jumping from log to log and hanging around. Not to worry, there are escape routes available for those not yet ready for such challenge. D doing his Tarzan thing over here. 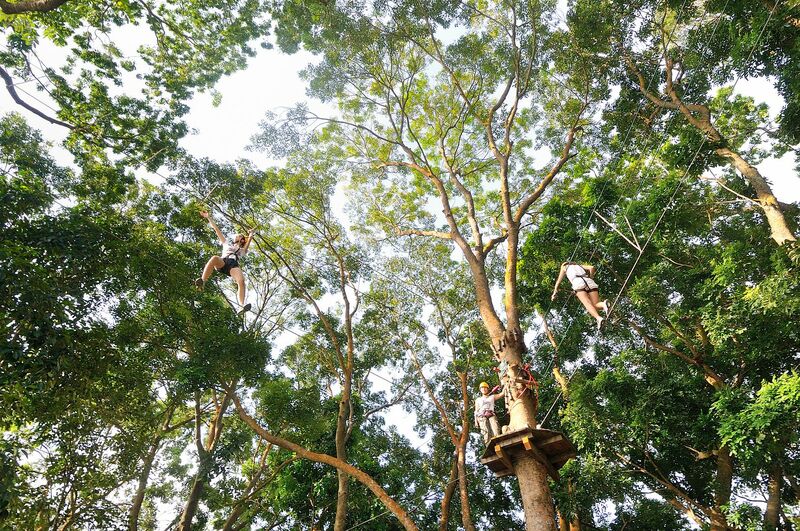 At the end of each section, participants descend from the trees, over the waters, to the forest floor. 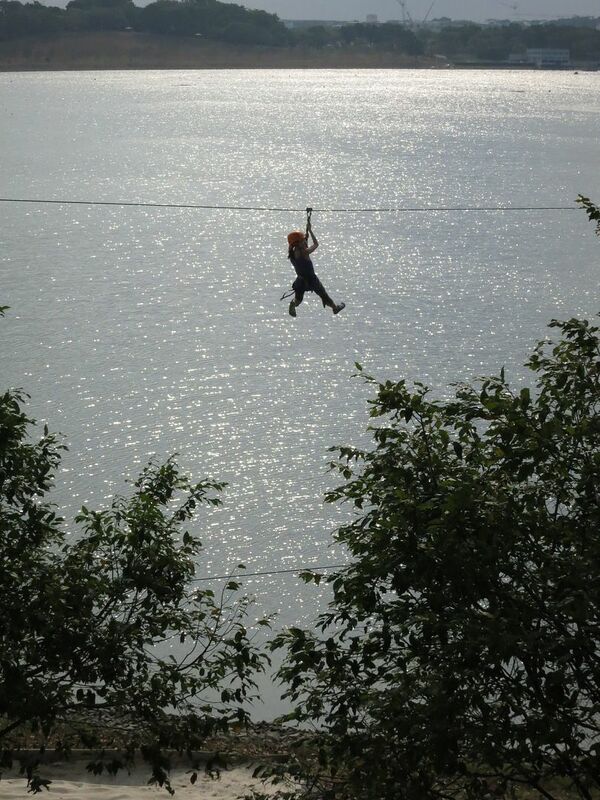 The longest zip for the Grand Course is 200m and it's really relaxing! Take time to enjoy the views of the waterfront and the park as you zip around. 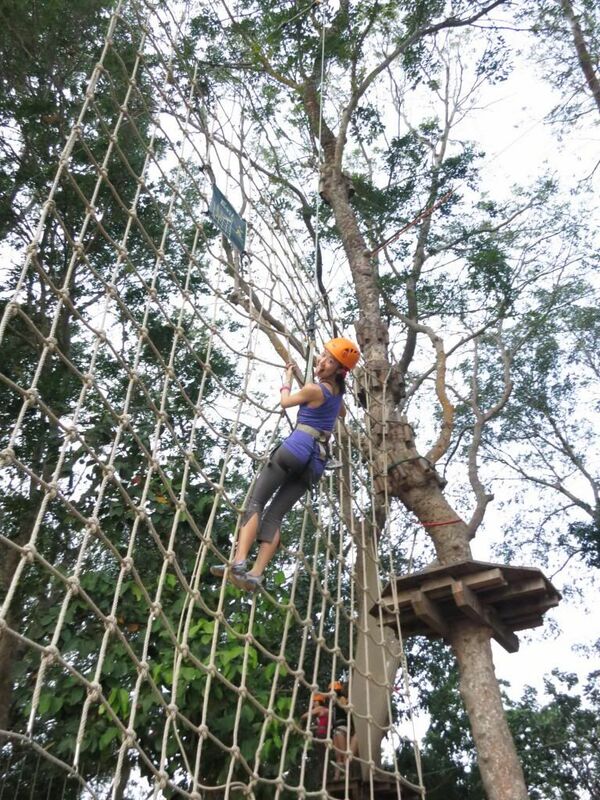 Of all the courses, the greatest challenge for me was the 12m Tarzan swing where participants jump from a 8m high platform and swing into a rope net 2 m below! I was all ready to chicken out but the instructor on the ground was goading me. There were many WTF moments before i climbed that platform. So here's me and my terrified face and cheeky S waiting to push me off again. Took the plunge before S could do anything stupid. Yes i screamed like a girl all the way. AHHHHH! And I DID IT! 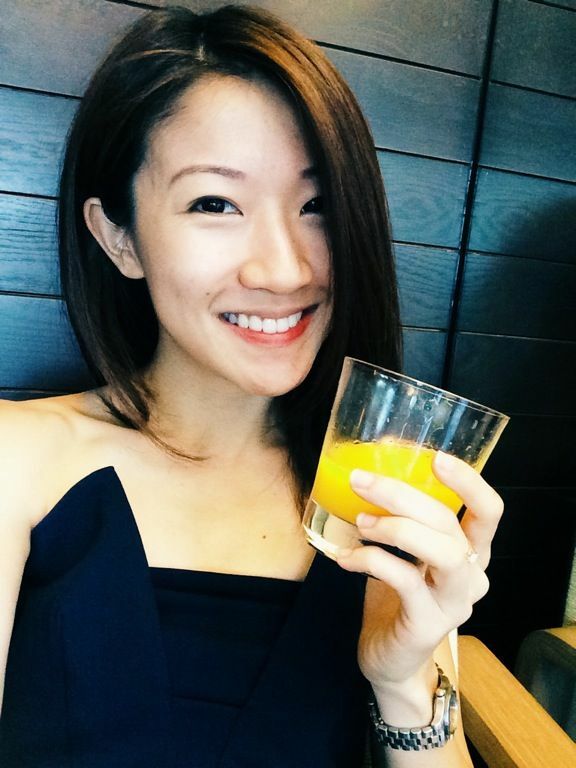 And the entire Bedok Reservoir heard it. Weet weet! It was exhilarating but no way in hell am i gonna do it again. Yes i'm a chicken but WEV. Interested in experiencing it for yourself? The Grand Course that we attempted is $44/pax. I would highly recommend it for couples or groups. 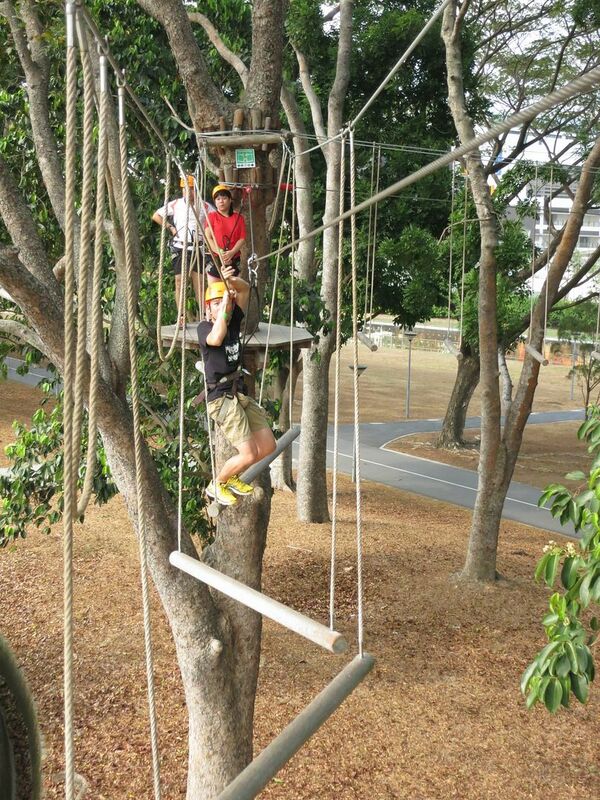 There is also a 16-stages Kids Course priced at $32 for 1st hour and $10 for subsequent rounds. 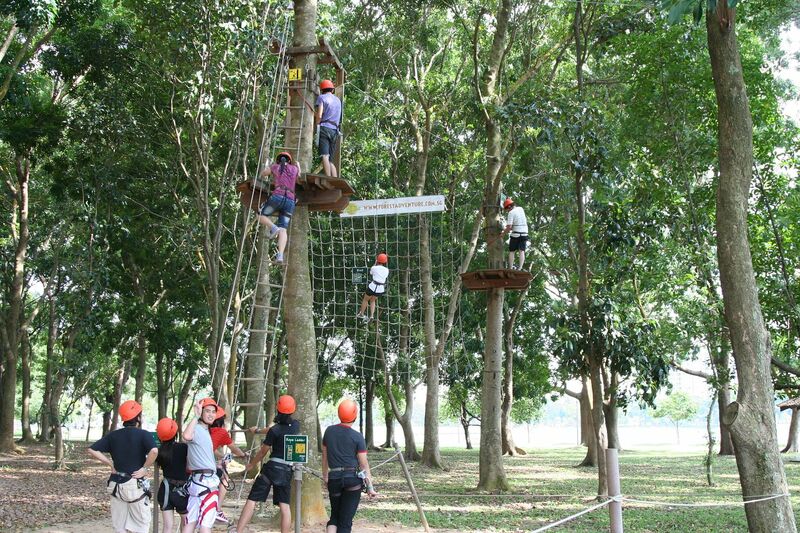 The children are connected to a continuous safety line at the start of the course and will not be disconnected till the end. Family packages and annual passes are also available. So yea! Time to have fun under the sun! Here's the location map. 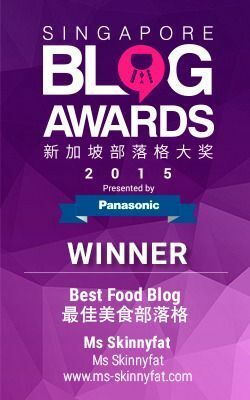 Thank you Forest Adventure for the invitation! Closed on Mondays except PH.